Kanata is the St. Lawrence-Iroquoian word for "village" or "settlement". “O Canada,” originally named “Chant national,” was written by Adolphe-Basile. Routhier (French lyrics) and Calixa Lavallée (music) and first performed in Quebec City in 1880. The song was approved by the Parliament of Canada in 1967 as the unofficial national anthem and adopted officially on July 1, 1980. The border between Canada and the United States is officially known as the International Boundary. At 5,525 miles, including 1,538 miles between Canada and Alaska, it is the world's longest border between two nations. The Canadian motto, A Mari Usque ad Mare, means "From sea to sea." At 3,855,103 square miles, Canada is the second largest country in the world, behind Russia. Snorri, the first North American child to be born of European parents (Thorfin and Gudrid), was born in Vinland around A.D. 1000. Newfoundland was the first part of Canada to be explored by Europeans. Ironically, it was the last area to become a province, in 1949. In 1642, a group of religious mystics from France were inspired by a vision to build a missionary city in the Canadian wilderness. Led by Paul de Chomedey de Maisonneuve and an Ursuline nun name Jeanne Mance, they founded Montreal. According to the 2001 census, 42.6% of Canadians are Roman Catholic, 23.3% are Protestant, and 16% claim to have no religion. 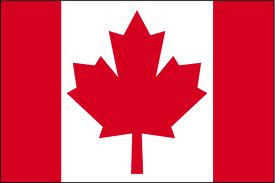 Canada became a country on July 1, 1867, when the British North America Act was passed by the British Parliament. The Mounted Police were formed in 1873, with nine officers.g In 1920, the Mounted Police merged with the Dominion Police to become the famous Royal Canadian Mounted Police, an organization that now has more than 28,000 members. Ice hockey is Canada's official national game. The rules of the game were first published in the Montreal Gazette in 1877. Canadian James Naismith invented basketball to give his physical education students at the YMCA Training School in Springfield, Massachusetts, an indoor team sport to play during the long winters. The capital city, Ottawa, was originally named Bytown after Colonel John By, who headquartered there while building the Rideau Canal to connect the Ottawa River with Lake Ontario. North America's earliest undisputed evidence of human activity, 20,000-year-old stone tools and animal bones have been found in caves on the Bluefish River in northern Yukon. North America's lowest recorded temperature was -81.4 degrees Fahrenheit (-63 C) at Snag, Yukon Territory, on February 3, 1947. Canada is known as the home of large animals like the moose and grizzly bear, but it is also home to about 55,000 species of insects and about 11,000 species of mites and spiders. Canada contains 9% of the world's renewable water supply. The official languages of Canada are English and French. Throughout Canada's history up to the current time, there have been conflicts between English and French-speaking Canadians. In 1527, John Rut of St. John's, Newfoundland, sent a letter to King Henry VIII—the first letter sent from North America. Canadians have made many important inventions, including Kerosene, the electron microscope, the electronic organ, insulin, the IMAX film system, the snowmobile, and the electric cooking range. Canada is a major producer and consumer of cheese. In 1997, Canadians produced 350,000 tons of at least 32 varieties of cheese and ate an average of 23.4 pounds per person, with cheddar being the most popular. Many famous authors have come from Canada, including Lucy Maud Montgomery (Anne of Green Gables), Margaret Atwood (The Handmaid's Tale), and Alice Munro (Lives of Girls and Women). The Moosehead Brewery in Saint John, New Brunswick, turns out 1,642 bottles of beer per minute. Canada has made a significant contribution to rock and roll, beginning with “Sh-Boom” by the Crew-Cuts in 1954. The natives of eastern Canada tell several stories of a mythical giant named Glooscap, who carved out many of the region's natural features to help him overcome his evil twin brothers. It is believed that these Glooscap stories might be the origin of many of the Paul Bunyan legends. The world's strongest current is found in the Nakwakto Rapids at Slingsby Channel, British Columbia. The current has been measured at speeds up to 18.4 miles per hour. The West Edmonton Mall in Edmonton, Alberta, was once the world's largest shopping mall. It now ranks fifth, but it still contains the world's largest indoor amusement park. Alberta has 50% of the world's supply of bitumen. The CN Tower in Toronto was the world's tallest free-standing structure until it was eclipsed in 2007. Manitou Lake on Manitoulin Island in Lake Huron is the world's largest lake within a lake (41.1 square miles). Canada maintains 38 national parks, which cover about 2% of the country's landmass. At 6050 m, Mount Logan in the Yukon is Canada's tallest peak. The longest Canadian river is the Mackenzie, which flows 4241 km through the Northwest Territories. The St. Lawrence (3058 km long) is Canada's most important river, providing a seaway for ships from the Great Lakes to the Atlantic Ocean. The educational system varies from province to province and includes six to eight years of elementary school, four or five years of secondary school and three or four years at the university undergraduate level. The principal natural resources are natural gas, oil, gold, coal, copper, iron ore, nickel, potash, uranium and zinc, along with wood and water. These include automobile manufacturing, pulp and paper, iron and steel work, machinery and equipment manufacturing, mining, extraction of fossil fuels, forestry and agriculture. The currency of Canada is Canadian dollar.